As we all know from the flood of emails coming into our inboxes explaining that privacy policies have changed and more, the dawn of the GDPR era is upon us. Technically companies have until tomorrow, May 25th, to get into compliance with GDPR. USV portfolio companies have been working on getting compliant for more than a year and we have been active in helping them do so and advising them on best practices. I blogged about GDPR here at AVC last September in hopes that all of you would also start working on getting compliant. If you have customers or users in Europe, you must comply with GDPR. But many companies are taking the approach that they will be GDPR compliant with all of their customers, regardless of geography. For this reason, GDPR is the biggest user data privacy regulation to hit the Internet, at least in the last decade, and possibly forever. There are some good things in GDPR. The basic notions that users have the right to control how their data is used and to opt-out of that usage seems right to me. But like all regulations, the implementation and compliance details are painful in parts and there certainly could have been a lighter weight way to get to the same place. My hope is that the US and other countries copy some of the better parts of GDPR but go without the overwrought elements. The other thing to note about GDPR is that we should expect revenue headwinds from it for the next few quarters. Less emails will be going out. Less engagement will be going on. And less revenue will be generated. I am OK with that. It’s a price to be paid for a step forward for user’s rights. No pain, no gain. A number of USV folks are using the Brave browser on their phones and thinking about using it on desktop too. We are not the average internet users at USV. We tend toward early adopter. I don’t want to bias anyone who wants to complete the poll, so if you want to see the current results, pls complete it and you will see the results after you do that. It’s interesting. I will say that much. Our portfolio company Cloudflare announced a consumer DNS service (a resolver) yesterday. It was not an April Fools stunt. If you want to use the Internet’s fastest, privacy-first consumer DNS service, then head over to 1.1.1.1 and click the install button. What you will do is adjust your computer’s settings to change the DNS servers your computer uses to resolve DNS queries (what server address is google.com?). So if you want speed and privacy, install 1.1.1.1 and you will get both. 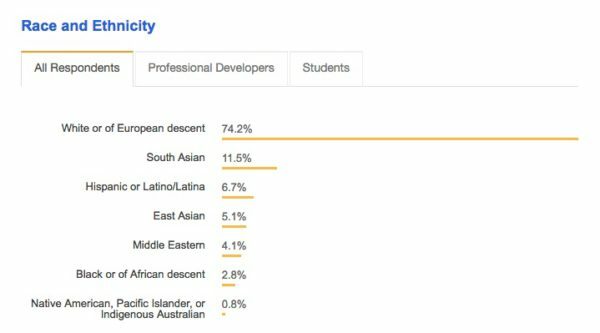 Every year our portfolio company Stack Overflow surveys its developer community and publishes the results. 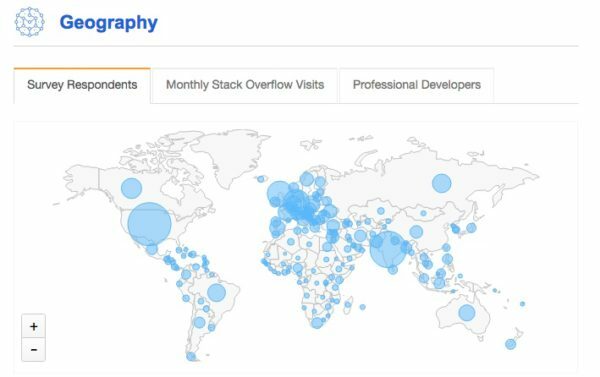 This year Stack had over 100,000 respondents to its survey from all over the world, making this survey possibly the most comprehensive view of the global software developer community. There is a ton of data here. It’s a 30 minute survey. You can see the results here. 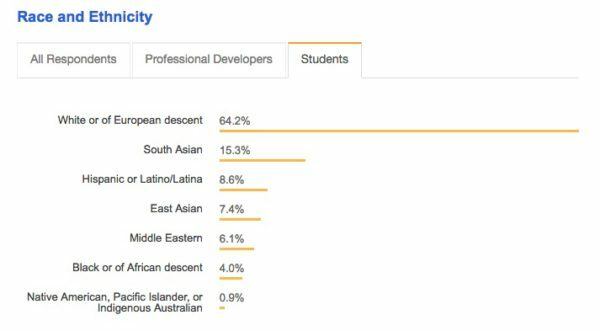 If we look at the gender and racial/ethnic mix of the students who answered the question, there is some promising data on racial/ethnic diversity, but less promising data on gender diversity. Efforts like I blogged about yesterday are badly needed to change these numbers. I found the technology questions interesting. 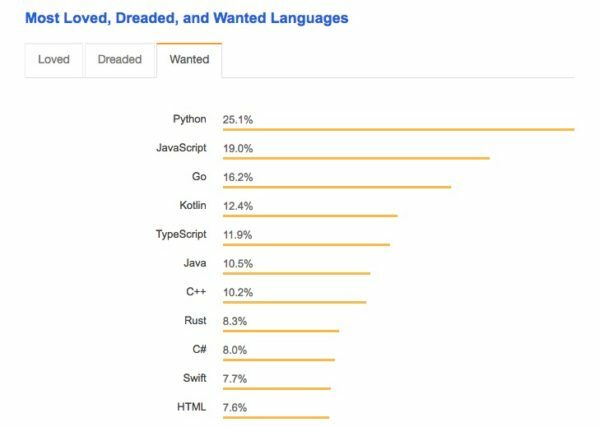 But Python is the most “wanted” programming language. 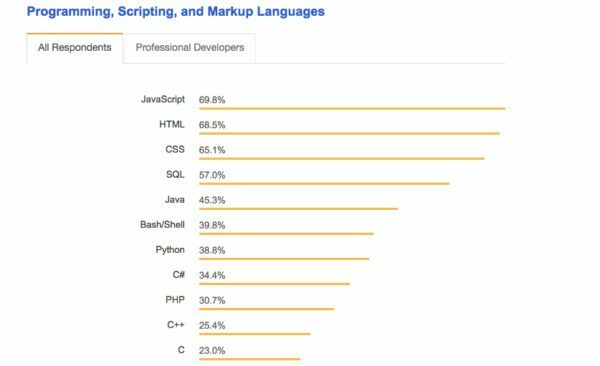 And Go and Kotlin are rising fast. Some great news for our portfolio company MongoDB in this survey. 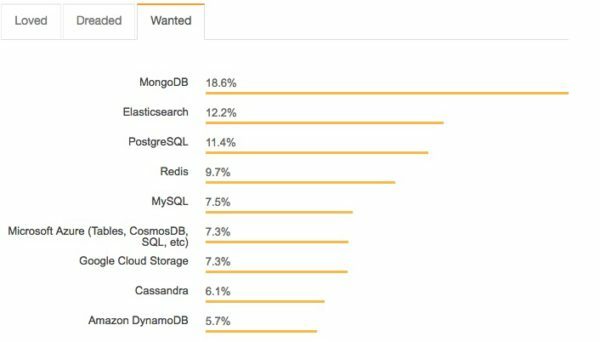 Mongo was the most popular non-SQL database and was the most wanted database of them all. Any service where 2/3 of its users visit daily is a big deal. And for developers, Stack is very much that. This post is not about the tragedy that happened at Parkland or the gun safety debate that has been re-energized by it. Those are both worthy topics but I’m not opining on them today. I do hope that this tragedy, among so many like it, will result in meaningful changes in our society in terms of how we protect our children in school and also how we allow responsible and healthy people to own and secure their weapons. What I am going to opine on is how Parkland is re-shaping the debate about how social media and technology more broadly is impacting our culture, our collective conversations, and our politics. In the beginning, the tech sector believed, and told everyone, that connecting the world via technology was going to be great, a technological utopia as it were. That, of course, turned out not to be true and what we have are both vast improvements (truly global real time communications that everyone can tap into) and equally vast problems (you can’t believe and can’t trust anything you read on the Internet). It is the classic good news/bad news situation. In the past few years, but most notably last year, the discussion of this topic has focused on the bad side of these changes. Fake news, hacked systems, bots, ad systems gone haywire, and so on and so forth. We collectively lost trust in social media and technology and became angry about it. Then comes Parkland. These amazing brave and vocal young adults, victims, with the same tools in their hands. And we see, again, the good side. The promise of Parkland, for me, is that this technology we have built and use every day can be an impactful tool for real people with real things to say to get their words out, and for the rest of us to see them, amplify them, discuss them, debate them, and understand them. I feel the pendulum on this issue swinging back to center, where it belongs, and I am very encouraged by that. I listened to Sam Harris talk to Niall Ferguson yesterday on Sam’s Waking Up podcast. Niall is a historian, an author, a journalist, and an academic. He has just published a new book on a topic that is near and dear to me, USV, and many of you; networks and hierarchies, and how these two forms of information flow and management have impacted society over the last five hundred years (or so). The book is called The Square and the Tower: Networks and Power, from the Freemasons to Facebook. I bought it for our Kindles today and will get into it asap. But just hearing Niall talk about the ideas in the book tells me that this is going to be an important read for many of us. We may think that the power of information networks to shape society is a new thing (Facebook, fake news, Trump, etc, etc) but Niall argues that there is nothing new here and these sorts of things have been going on in analog networks for hundreds of years. As Shakespeare said, “what’s past is prologue” and we should learn as much from the past as we can. That’s what historians are for, after all. I plan on doing that and you may want to join me. This was seven years ago. I went back and watched it recently and it has stood the test of time. we are ending the HuffPost contributor platform. The platform, which launched in May 2005, was a revolutionary idea at the time: give a megaphone to lots of people ― some famous, some completely unknown ― to tell their stories. At that time, social networks barely existed. Facebook was a nascent dating site for college students. Twitter had not been invented. The platforms where so many people now share their views, like LinkedIn, Medium and others, were far in the future. While that is sad news, it is not the least bit surprising. I have been asked to blog at Medium, LinkedIn, HuffPo, and many other places. I always tell them that I am not going to do that. If they want to repost something I have written here on their platform, that is cool with me. The content here at AVC is creative commons licensed and freely available for reposting with a few reasonably constraints. But this is part of a much larger and more important narrative. We are in the “Internet Two” phase as Steven Johnson called in it his piece that I blogged about yesterday. Internet One was an open network, open protocols, open systems. Internet Two is closed platforms that increasingly dominate the market and own and control our content and us. We need to get to Internet Three where we take back control of ourselves. It is high time for that to happen. The HuffPo news is a small example of what that is so important.